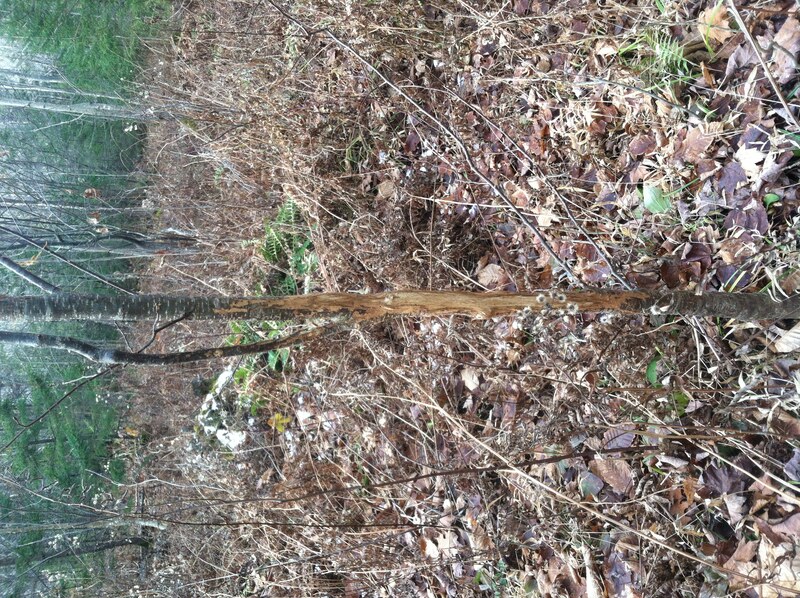 Vermont Rifle: Hunt 1 – Opening Day - the4pointer.com | Real Hunts. Unreal Stories. I checked in with my wife around 1 pm on opening day and she asked “Why is there a contact lens case in the kitchen sink?” I answered, “For the same reason why there is no gasket on my thermos cap.” My two year old Sam loves to play with anything he can get his hands on and I discovered at 4:45 Saturday morning that not only did he fill my thermos with interesting things he also took the gasket off the cap and i couldn’t find it. I rifled through the pantry but it was nowhere to be found. So, I screwed the cap on as tight as I could and although it still leaked I figured I could keep it upright the whole day. After I finished pouring coffee into my leaky thermos Josh and I headed on our way and we arrived on location in central Vermont and met up with Dad and another hunter named Jim. Josh headed to a climber set up on an escape route that was also littered with a bunch of fresh rubs. 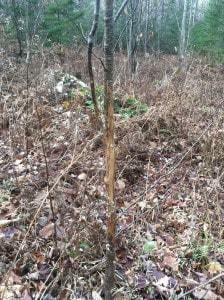 The spot has produced in the past and hopes were high as he walked off towards the stand in the dark. Dad and Jim spread out down low in the hardwoods while I took the high road in search of a buck headed for the hills early in the morning. 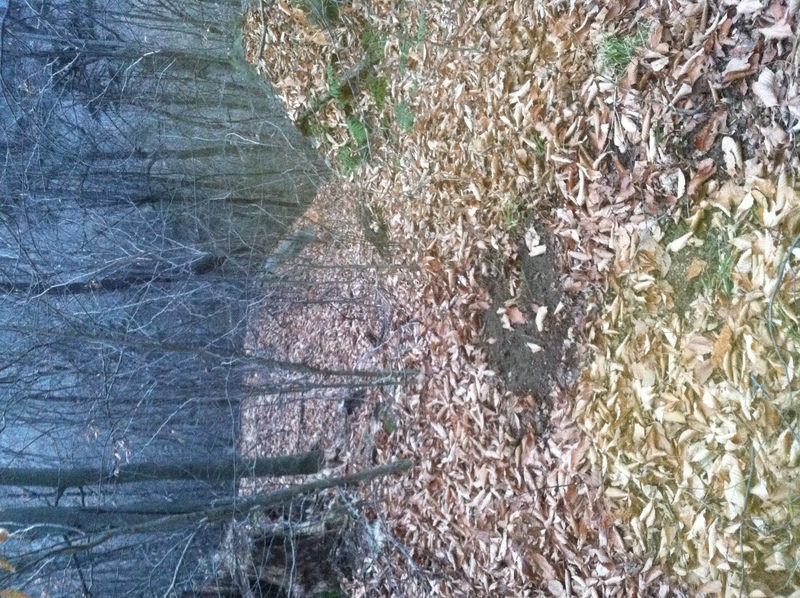 As I worked my way up and around the ridge I came across a semi fresh scrape. 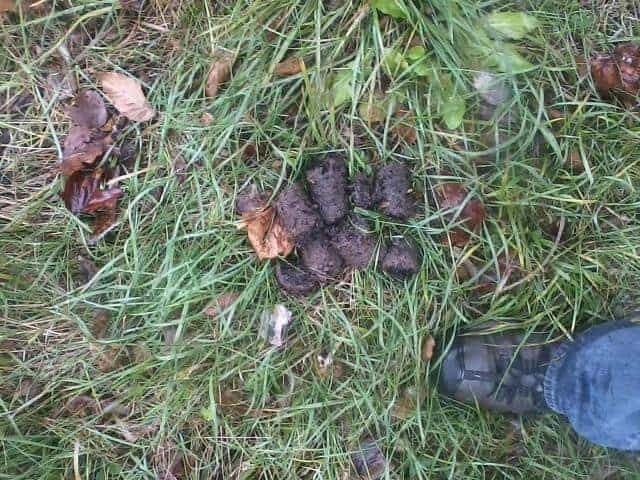 It was in a spot where we find one every year and it appeared to be within the last couple days. I slowly hunted through the area calling every 15 minutes. It was unbelievably still and dry so sounds were carrying a long way but it was obvious that there were no deer in the area so I continued on around the ridge. Eventually I reached the upper logging road I had been hunting towards. Usually there are scrapes on this road as well and I did find some old ones but there didn’t seem to be much else happening there. 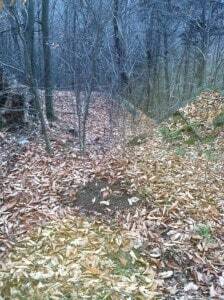 However, I hunted on and sat for at the base of a big hemlock tree for a hour in hopes that a buck would amble by. 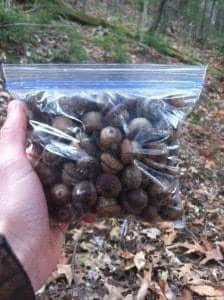 There was an oak tree 10 yards away that produced a heavy crop of acorns so I collected a bag full for Sam. 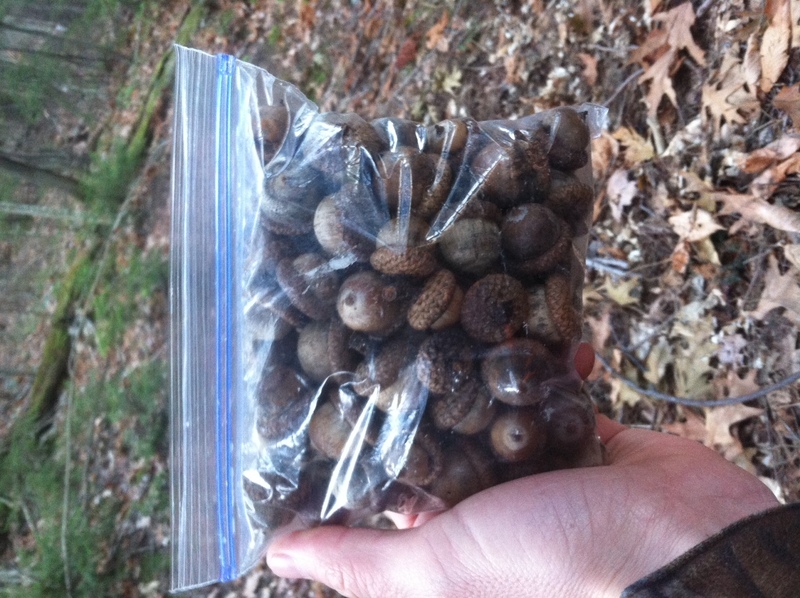 He loves the ones with “hats” and I knew he’d be excited when I handed him the bag of treasures from the woods. The rest of the day was pretty slow. Josh saw a bobcat about 30 minutes after the sun peaked over the horizon but the temperatures had crawled into the low 50’s deer movement was nonexistent. 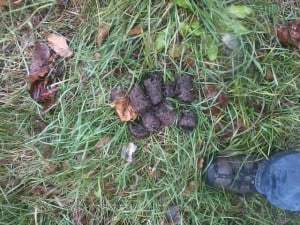 Jim left at noon and I set up in a climber over a few apple trees hoping to see a big bear that had left a pile of poop the size of a boot. The apple trees, although sparse with apples, were covered in claw marks and bear sign was prevalent. However, I didn’t see anything nor did Josh or Dad.